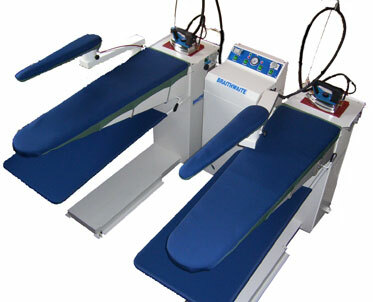 A well pressed garment is just as important as a well-made garment when it comes to presentation, that is why this range of under pressing equipment has been designed to be of the highest standard, delivering professional finished results from easily installed and maintained equipment. Standard in-built equipment includes: cold water holding tank, automatic water pump, boiler blow down valve & 2x electric/steam iron mounting ports. As no or little installation is required; it can be put almost anywhere there is a suitable single or 3-phase power supply. To ensure safe and efficient trouble-free running each boiler is fitted with a visual pressure display gauge, internal pressure level regulator, top mounted safety release valve and to save energy it has an automatic low water level element cut-off and an economy button, which turns half of the heating element off when there is only a small demand for steam. As the Gak steam generator is automatic and self monitoring, all you have to do is fill the reservoir with cold water and switch it on. The electronic water level monitor controls the auto water pump and fills/tops-up the internal stainless steel heating chamber as needed. When in use: cold water is added in small controlled amounts, so you don't loose pressure or temperature, allowing you to continue working with-out interruption. Maximum steam pressure is regulated with the heating elements turned on & off automatically. The operator control panel shows: steam pressure, element activation light, min/max water levels, plus illuminated power switches. Top mounted electrical sockets allow you to add industrial steam irons, steam guns, vertical irons or steaming handles. Enclosed metal construction, with full length industrial cabinet on castors. 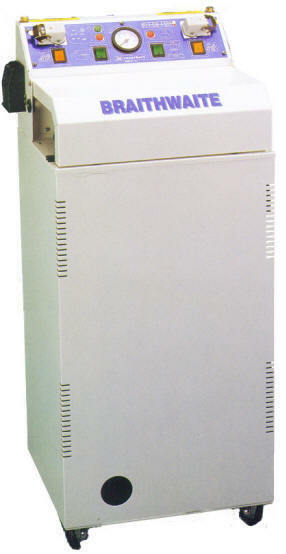 Large internal stainless steel heating chamber. Built-in visual steam pressure gauge. Set at a working pressure of up to 3.5 bar. Electronic water level monitor & control. With led indicators. Internal cold water reservoir fitted (can also be connected direct to water supply if required). Pre set pressure regulator fitted. Pre set Safety element thermostat fitted. 2x Electrical equipment sockets. For use with one/two industrial irons or steam guns & steaming handles etc. Economy switch fitted: allowing you to turn half of the heating element off.